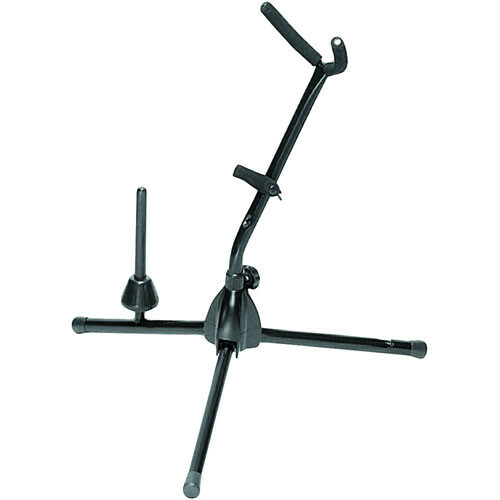 The On-Stage SXS7101B Alto-Tenor Sax Stand with Flute Peg is a tripod folding leg assembly that holds an alto or tenor sax with a screw-in flute peg. It includes a screw-in removable wooden peg for holding a flute or a clarinet. The angle of the center shaft and the upper and lower yoke allow efficient placement of the instrument. With the soft velveteen rubber pads, the stand prevents damage to the finish of the instrument. The stand can be broken down into 5 components and can be stored conveniently. Box Dimensions (LxWxH) 15.4 x 5.6 x 4.0"